Born in Rosenheim, Bavaria, to minor gentry, he joined an infantry regiment in World War I, but arthritis made him unfit for his duties. By pulling strings he became a fighter pilot and established himself as one of Germany’s aces with 22 victories. During 1939 he was made Chairman of the Reich Council for National Defence and named as Hitler’s successor. He planned the Luftwaffe’s role in the invasions of Poland, Norway and France. 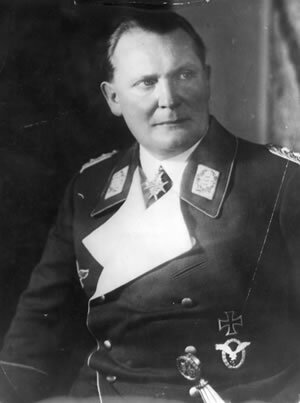 In 1940, when Hitler made nine of his generals field marshals, Göring was given the unique rank of Reichsmarshall. He had reached the height of his career. Self-indulgence softened him and more ambitious Nazis, Himmler, Bormann, Goebbels and Speer, began to bypass him and reduce his importance. At the Nuremberg trial he was found guilty on all counts and condemned to death. He cheated the hangman by taking cyanide on October 15, 1946.